I like the B &amp; B a lot. Twice I spent my holidays there and felt very comfortable. It is very comfortable and is very friendly. Thank you for a nice stay. Absolutely perfect place in every way. Very clean, lovely rooms and very friendly hosts. Breakfast very tasty with lots of choices. Definitely book this B&B. Excellent facilities.Good breakfast. Friendly host. Good recommendation for pub food nearby. Very nice house and we felt really at home.made very welcome by owners.nothing too much trouble and would certainly return if occasion arises,!! Very well laid out room at a reasonable price. Very friendly hosts. Best scrambled eggs I've ever eaten!! Lovely guest house. The owners were very helpful and accommodating . Lovely Irish breakfast. There is a very steep hill down to guest house that would not suit anyone with mobility problems but if you have a car it will be fine. We really enjoyed our stay in the pleasant small hotel. The proprietors were great, the bed comfy, the whole place clean and comfortable, and the breakfasts generous and lovely. We would definitely stay here again. Really enjoyed our stay. Hosts very accommodating and looked after us well. Excellent! Second time staying here. Great B&B, Highly recommended. Very nice, clean rooms, Friendly owners and a good centre location for a good price. very nice, very clean, very beautiful. Thank you! Very friendly. Clean. Convenient. Breakfast lovely. All round great stay. Very happy with stay. Prices reasonable, accomodation very good and friendly atmosphere. Would recommend. Everything took place without problems. I recommend this place. 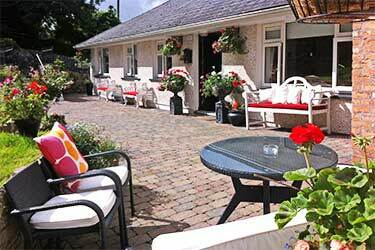 Perfect for a short or long stay in southern Ireland. Near public transportation but back from the bustle of the main road. The hosts went beyond expectations to help us - very attentive hosts. A lovely and comfortable sitting room is provided for guests. Highly recommended. Very comfortable. A lovely quiet setting and very friendly. Lovely B&B, clean spacious room, location was very central, bars and shops nearby, right next door to the Oriel hotel. Very reasonably priced. Owners were very friendly and helpful! Would recommend to anyone looking to stay in Ballincollig. There was no heating in my room all night, really cold, should have slept outdoors! Disappointing, experience I have to say. the owners are never nice but like to sleep in comfort. we got lost on the way and Angela was very helpful with directions over the phone.great breakfast in the morning.we had a triple room and it was very roomy. I recently gifted my parents with a night at the Orchard B&B.. They really enjoyed their time there. They said the room was lovely, very friendly staff, very spacious and welcoming and they said the best was great. They would definitely recommend this b&b to others. One of the best B&Bs I have ever been to. Excellent location in Ballincollig; a great spot from which to explore Cork. Very welcoming and friendly, couldn't have been more helpful and accommodating to us and our nine month old baby. The room was really lovely, there was a kitchen and a lounge that guests could use, which was very welcomed, and a lovely outdoor area too. Couldn't recommend enough! This was the second time I stayed with Angela and Dennis, previous visit was July 2015.The warm welcome and hospitality that was extended to myself and my wife who stayed on the second night was very much appreciated. The standard of the room and the range of breakfast available is of the highest quality. We will br frequent visitors to Ballincollig over the course of the year and will certainly return to the Orchard. I could not recommend it highly enough. Nice place. Very quite, good beds and perfect breakfasts. Thanks for the 4 nights we spent at your B&B. Excellent location and price, clean and warm, right next to Ballincollig village and church. Staff very friendly and welcoming. Breakfast tasty as welll! I booked this B&B as I was attending a Wedding nearby. The accommodation was perfect, my single room was very spacious and comfortable, with a large bathroom and shower. The staff were very friendly and welcoming. The breakfast was utter perfection as well. Beautiful and lovely B&B with the nicest people! What a hidden gem. I was made feel so welcome. Room was spotless and lovely. Would never stay anywhere else in Ballincollig. Highly recommended. I went for work in Ballincollig but next time would love to bring my husband for a great weekend break. Down in Cork regularly visiting family but first time I've stayed here. Ideal location for us and very clean and comfortable. Owners were very friendly and welcoming. I'll be staying here again just wish I found this place years ago! Lovely B&B set in a peaceful and convenient location. Very friendly landlady. I stayed while on business and it was perfect for that purpose. Will definitely stay again. Friendly host, breakfast okay, room spacious, bathroom okay. Well-situated. The bed and breakfast was great. We had a lovely time. The room was beautiful. Stayed here for one night, lovely safe B&B, very pleasant welcome and the breakfast in the morning set me up for the day! we stayed in March 6 days at the orchard B&B. It´s a nice place. We had a nice, big room with an extra room for clothes and luggage. The breakfast is very good and Angela and her husband are very friendly. It´s a good place. We really enjoyed our stay here. I have to say it was one of the nicest b&b we have stayed in. Lovely accommodation, easy access to the city. Warm friendly host and breakfast was lovely. Parking a bit cramped. Excellent. Warm comfortable lodgings with friendly owners. I will definitely stay again. Extremely pleased with my visit to the B&B...really friendly people and they went out of their way to offer advice. Was touched with them closing the curtains and putting on lamp when we were out of the room for the evening. Look forward to visit again. Perfect place to stay and absolutely the place where I return when I am back in Cork for business. Very friendly hosts, very lovely room, secure private parking and superb breakfast. My wife and I stayed at the Orchard on September 18, 2014. The en suite room was clean and the bed was comfortable. The B & B is a short walk away from a good restaurant. The only problem was finding the B & B. It is tucked in behind a new hotel at the end of a lane. It is well signed, you just have to have faith the signs will take you there. Second stay here. Nice rooms. Great breakfast. Nice people. All perfect. We have been two days in August, my husband, my three children and me. We had two beautiful rooms ensuit so my two older children of 8 and 6, could sleep in the room nearby. Angela and her husband were lovely and very helpfull. Breakfast was gorgious!!!! I would recommend to everyone. VERY NICE WOULD STAY AGAIN. Stayed here two nights April 2014. Quiet, very clean, friendly owners and great breakfast. Highly recommend. If we visit Cork again we will defiantly stay here. Absolutely perfect place in every way,would highly recommend. We asked for a quiet room and the room was perfect,absolutely lovely. The owners were very nice. Breakfast was gourgeous and there was a lovely sitting room we could relax in as well.very close to the main areas of Ballincollig. Will definately be back. Great central location. Friendly staff. Great food. This is my 2nd time here, will definitely be staying again. I have reason to travel to Cork regularly and often stayed in the city on Western Road - until I discovered this gem. It is so peaceful, the rooms are so comfortable and the breakfast is so fab! Cooked to order so it hasn't been sitting for ages. The selection of cereal, muesli, fruit and extras is excellent. You can make a cup of tea and use the kitchen out of hours, there is a lovely siting room and a fab garden for your pleasure! Perhaps best of all are the family who run this place. So welcoming and friendly. My only worry is that everyone will discover my secret and the place will be constantly booked out. If you are looking for a home away from home in Cork - this is it! Extremely pleasant b & b. The accommodation was clean and the food excellent. We thoroughly enjoyed our stay and would recommend it to our friends and family. I have worked in the hospitality industry so I was rating Orchard House from the moment I booked. We arrived later than intended and were not able to contact to say we were delayed but still warmly welcomed. Room was very clean, comfortable and warm. Bathroom was excellent and had a great shower could have stayed in all day! Greeted warmly at breakfast and the breakfast itself was very good. Thoroughly enjoyed the stay and would definitely recommend it. Very comfortable B&B in a lovely quiet location. Plenty parking. Ideal for a stay in order to access the City. Hosts very welcoming and accommodating, very homely atmosphere. Nice accommodation and good breakfast. The owner was very welcoming and friendly, I would definitely return. Room perfectly clean and quite thanks to its position. Good breakfast. Will definitly stay at the Orchard B&B again when I'm in the Cork again. Very nice people & fantastic food. Very easy location to find & within walking distance of shops & other amenities. stayed in this b&b for two nights 21-6-13 down a steep hill but ok if you have a car if not plenty of taxis,15 euros a little over 10 min to cork city.the rooms were spotless and a fair size.good choice of food for breakfast.very good value for you're money compared to the hotel next door.we had a good time around ballincollig,if you're in it drop down to sams bar bar great craic.would like to thank dennis and family for putting up the four of usone bold.i would have no hesitation in recommend this b&b. Had a great experience when trying to book a room in the Orchard B&B. First evening I rang and ask about the availability and they confirmed they have a room available. The next morning I was trying to book the room over the phone, however lady told me they are booked out. So it seemed a bit strange as they confirmed before they have more than 1 room available so I also tried over the email. I have received a confirmation 10 days after my intended stay that the room WAS actually available. Guys, way to do business!!!!! Lovely rooms with lovely service and attention to detail and great food. I really enjoyed my stay in the Orchard. Every aspect was top notch. The room was pristine, spacious and comfortable. No detail was overlooked. I was impressed and reassured by the security - no one can gain access without a swipe case or fingerprint recognition! It's also secure and tranquil because it's a good 150m away from traffic. Breakfast superb. Fantastic value for money. I was so pleased I tried to stay a second night but they were booked out. Highly recommended. I'll be back. What a lovely B&B this was. Set down a lane away from the main road which can be dark at night was very happy with the setting. Everywere was lovely and clean and well kept. The owner that we met every morning for breakfast was very friendly, offfering us anything we wanted to eat for breakfast wich was very enjoyable. Friends of ours stayed in the big hotel just up the road, but they had problems with noise at night making it difficult for them to sleep, they were sorry that they didnt book in here as it was a very enjoyable to stay there. If ever we visit here again we will be booking again to stay here. Lovely B&B, well recmmended.